This year, my husband gave me a very useful Valentines Day gift:) He helped format and e-Publish my Tutorial on Beyond The Sand Dollar, while sitting at the airport enroute to India! I had made all the pieces, written up all the instructions—text and sketches, and had the step-by-step process pics. But had run out of time to format and publish before I left for the trip. My ‘very smart’ hubby stepped up and helped complete it—-on his Laptop…in the airport between flights. I think he’s a keeper…correct? After months of research and experimentation, I finally completed my Tutorial on Coral Sculptures. These are free standing pieces, on glass stands (instructions to make the Stand provided in Tutorial), which make stunning decoration pieces. The e-Tutorial is available from the Learn Tab on this site. Now to ‘play’ some more with glass…in preparation for the next Tutorial! June 1st, 2018: Woohoo…I am now a published author! 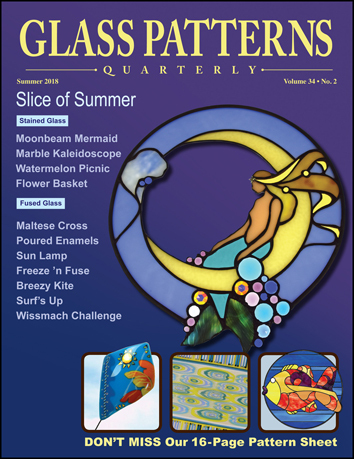 Check out my Tutorial on how to make a Glass flower—-the Maltese Cross— in the Glass Patterns Quarterly magazine, Summer 2018 issue. October 19, 2017: Just installed my Floral Fence at the brand new John R. Oshei Children’s Hospital (OCH). Honored to be named a Signature Artist for the 4th Floor.